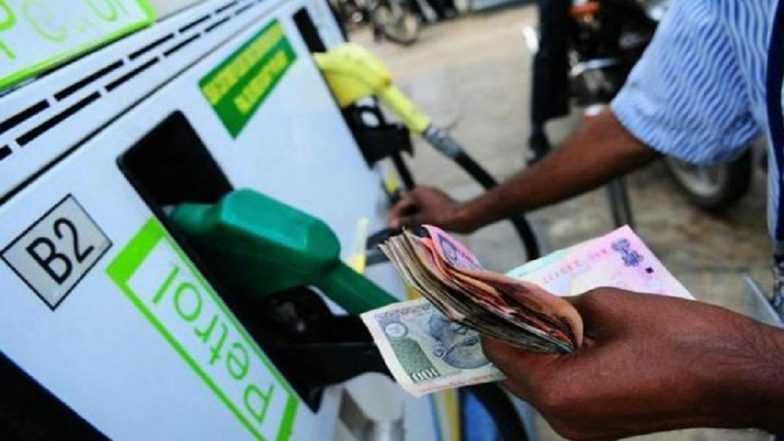 New Delhi, March 24: Petrol prices rose around 5 paise across the four metropolitan cities on Sunday while the cost of diesel remained unchanged, data on the Indian Oil Corp's website showed. In the national capital, petrol was priced at Rs 72.86 per litre, up from Rs 72.81 on Saturday. Price of the fuel in Kolkata, Mumbai and Chennai was at Rs 74.93, Rs 78.48 and Rs 75.67 respectively, up from Rs 74.89, Rs 78.43 and Rs 75.62 per litre. In Kolkata, the price was up 4 paise from Saturday while in the other three cities it rose by 5 paise. Domestic fuel prices have largely been on an upward movement during the first three months of 2019. In Delhi, petrol prices rose over Rs 4 per litre since January 1. The uptrend in domestic prices is largely attributed to the bullish global crude oil prices. The benchmark Brent crude oil is currently trading around $67 per barrel. Diesel prices were unchanged from Saturday's levels at Rs 66.60, Rs 68.39, Rs 69.76 and Rs 70.37 per litre in Delhi, Kolkata, Mumbai and Chennai respectively.